In this heat, the last group of seven amateur cooks try to prove to judges John Torode and Gregg Wallace that they deserve a place in the quarter-final. In this heat, the last group of seven amateur cooks try to prove to judges John Torode and Gregg Wallace that they have the potential to be the 2018 MasterChef Champion. This year sees the return of the MasterChef Market, stocked full of the best quality produce from across the world including meat, fish, fruit, vegetables, nuts, pulses, grains and dairy. The challenge is to invent and then cook one dish using anything from the Market. This time, the featured ingredients include lamb lion, chicken thighs, scallops, salmon fillets and prawns. They have an hour and 10 minutes to dazzle the judges and prove they are good enough to stay in the competition. The stakes are high in this round and it is important to choose wisely because after tasting all seven dishes, John and Gregg will decide which four cooks are good enough to stay, while three cooks will be sent straight home. The four remaining cooks now have one more challenge standing between them and a quarter-final place. They must cook an impressive menu that will excite not just John and Gregg, but also some very special guests. 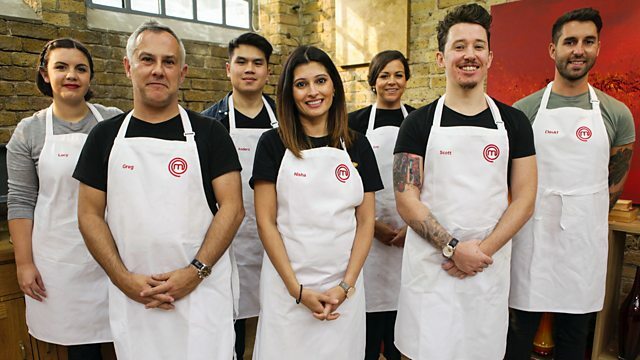 In this second heat, the contestants must attempt to impress the MasterChef champion Ping Coombes (2014) and 2011 finalists, Tom Whittaker and Jackie Kearney. After the four hopefuls have cooked, John and Gregg will decide who has what it takes to go through to Friday's quarter-final. In a competition where only the food matters, these amateurs will need to be good to survive - taking their first step towards being crowned MasterChef Champion 2018.